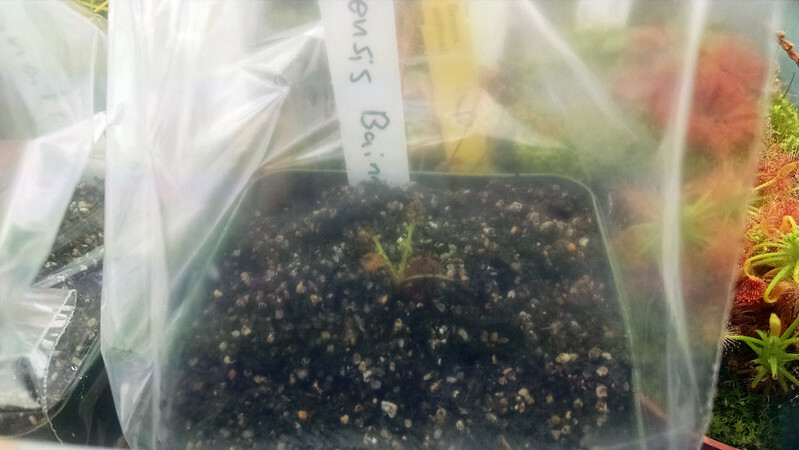 Long overdue potting |Sundews Etc. 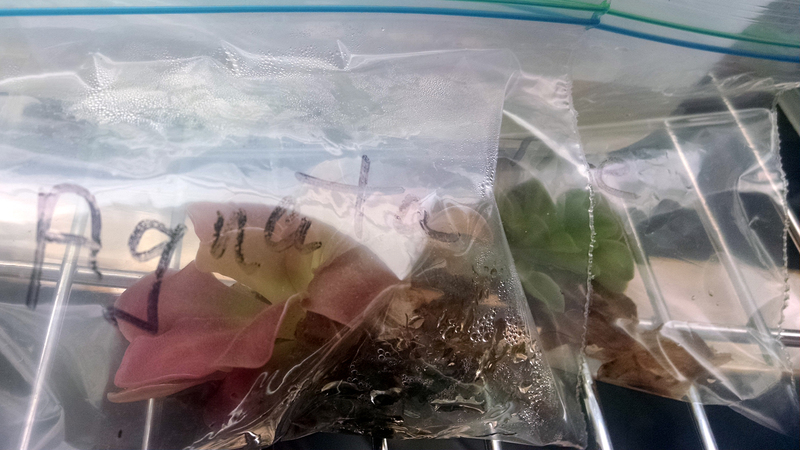 Several weeks ago I was very kindly gifted 2 Pinguicula by a BACPS member who invited me over for coffee. I was pretty amazingly busy at the time, and had yet to pot them up. Luckily, they seemed pretty happy to chill out there in the bags. I especially love the leaf color on the P. agnata. Pings are adorable. Pinguicula agnata and Pinguicula 'Pirouette' are apparently pretty vigorous and didn't mind the treatment. 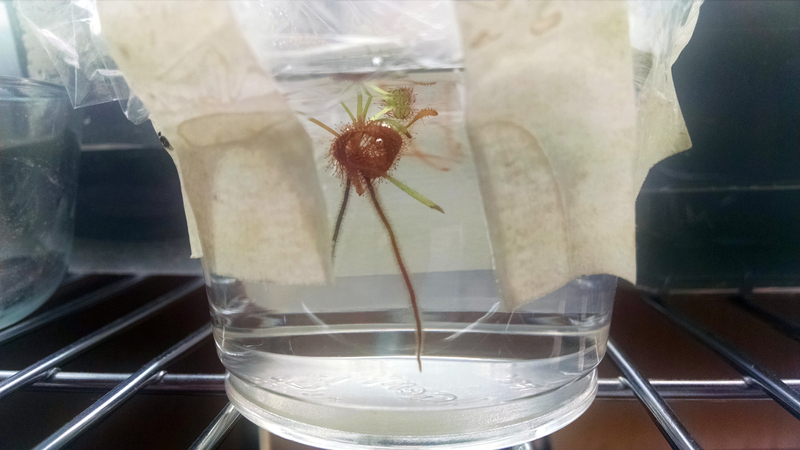 I've also got a leaf cutting of Drosera capensis Bainskloof that has developed quite nicely floating in some water. Those are impressive roots for a leaf cutting. It's even got some pretty respectable roots. It was time to transfer to the media. 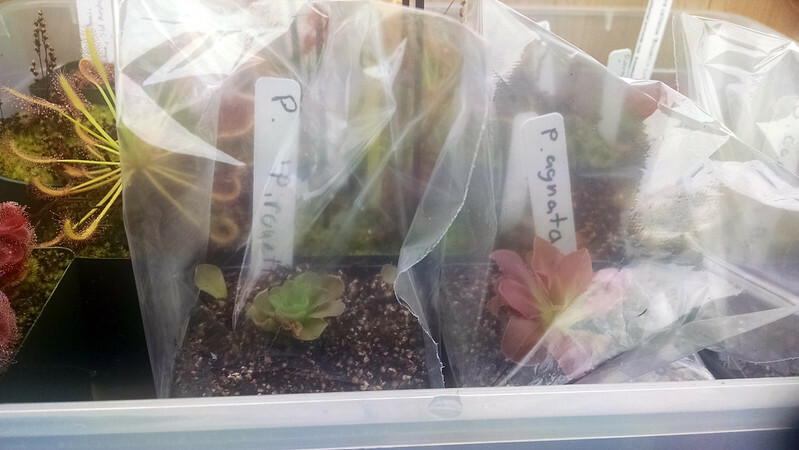 I don't have any pictures of the potting process, but it was pretty straightforward. Even mature pings don't have much of a root system, so I just sort of stuck them on the pot and piled a bit of soil around their base. For the D. capensis Bainskloof roots I made a little hole and then worked them in. I bought these sandwich bags specifically to use for my plants. Soon I can start feeding, and then it'll really grow. The pings look pretty nice, but the leaf cutting will need a couple weeks to settle in at least. I also stuck a couple of leaves that fell off of the P. 'Pirouette' during potting into the soil. Maybe they'll strike! Looks great. I just took my first leaf cutting of Drosera admirabilis this morning. I'll hope it gets roots like yours!